Chief Roger Redman says there's more that unifies his community and the Ahmadiyya Muslim community than one might think. 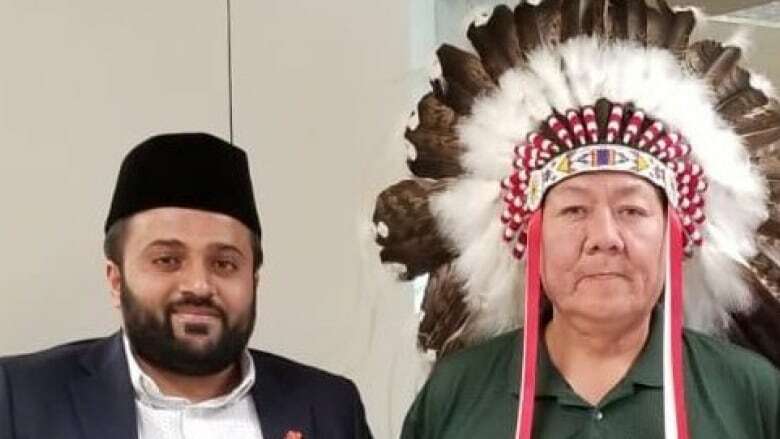 Chief of the Standing Buffalo Dakota Nation near Fort Qu'Appelle, Redman said he started speaking with the local Ahmadiyya Muslim community about a year ago. The Muslims started visiting the First Nation, organizing food runs and working on the school. Now, Redman has travelled to London along with a coalition of First Nations chiefs, elders and young people from across Canada to share their story with Ahmadiyya Muslims from around the world. 'They seem to be about love,': Mobile Muslims set up in Sask. "They're a peaceful people," Redman told CBC Radio's Saskatoon Morning. "And Indigenous people, we're a peaceful people too." Redman is scheduled to speak at the Jalsa Salana, an annual convention that brings together Ahmadiyya Muslims from around the world. "Working together, and having those discussions with the Muslim community, we're finding a lot of similarities," he said. "When we talk about our culture or some of our general views, principles, when we talk about our traditional governance." Ahmadiyya Muslim Rashid Ahmed says his community has made communicating with First Nations people a priority. "Most of the members in our community are immigrants and refugees, so it's important to build bridges," said Ahmed. 40,000 people are expected to attend the London gathering.